It takes a lot of work to make the Pack “go.” The work comes primarily from the families that make up the pack, assisted by volunteer and professional Scouters at the District and Council level to offer guidance and structure for their program to succeed. Some great information here about volunteering to help out. The help you provide can be varied and take advantage of your abilities and interests. Pitching in at a Pack event like a campout or derby. Leading: Commit to a role in the Pack leadership, requires registration. Some roles are uniformed roles, all leadership positions have a training requirement. Pack Committee – Every pack has a pack committee, which consists of at least three members (chair, secretary, and treasurer). By handling administrative and support tasks, the pack committee allows the Cubmaster, den leaders, and their assistants to focus on working directly with the Cub Scouts. Pack Committee Chair – The Pack Committee Chairperson organizes and chairs the Pack Committee. 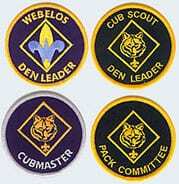 Cubmaster – In Cub Scouting, the person who leads the pack is called a Cubmaster. The Cubmaster is responsible for the monthly Pack Meeting which includes all boys, leaders and parents from all dens. The Pack Committee develops and funds the pack program with the help of the Cubmaster and Den Leaders. It is the Cubmaster who conducts that program. Assistant Cubmaster – The assistant Cubmaster is recommended by the Cubmaster, approved by the pack committee and chartered organization, and registered as an adult leader of the BSA. Be ready to fill in for Cubmaster as needed. There may (and should!) be more than 1 Asst Cubmaster per Pack. Assistant Den Leader – The Assistant Cub Scout Den Leader shares the work of the Cub Scout Den Leader and may be called upon to serve as a family contact or record keeper, or to handle other details of den operation. Each den should have at least one assistant den leader, and more if needed. Webelos Den Leader – A Webelos Den Leader is an adult leader who is in charge of planning and running Webelos Scout den meetings, usually with one or more Assistant Webelos Den Leaders. Webelos Assistant Den Leader – The Assistant Webelos Den Leader shares the work of the Webelos Den Leader and may be called upon to handle various details of den operation. Every Webelos den should have at least one assistant den leader. Treasurer – Responsible for primary bookkeeping, accounting, and banking on behalf of the Pack. Takes in monies due to the unit and dispenses checks on behalf of the unit. Pack Trainer – The main responsibility of the Pack Trainer is to ensure that the adults involved in the Pack are trained for their positions and are aware of supplemental training opportunities. Awards Chairperson – coordinate purchase and preparation for presentation of unit awards, rank advancement, and special purchases. Membership Coordinator – The unit membership chair is appointed by the committee chairman to help ensure a smooth transition of new Scouts into the unit and orientation for new parents. Responsible for recruiting campaigns and for year-round recruitment, growth and retention. Secretary – Keep minutes for Pack Committee meetings and distribute them to the Pack Committee in a timely manner, send out notices to the Pack (either via mail or email) for upcoming Pack events and Committee meetings, keep a current copy of the Pack roster and keep attendance for meetings. Training: Every scout deserves a trained leader. The first step in any registered role is to complete Youth Protection Training. Then, there will be role-specific training, depending on the position in which you will be serving to be considered 100% trained. Detailed information about training here. Here is the training site: http://www.scouting.org/Training/Adult.aspx and it will explain some of the basics. You will need to create an account on My.Scouting (https://my.scouting.org/) You can take any/all the lessons before applying or wait, but youth protection (YPT) must be complete before the application is turned in as the certificate is submitted with the application. There are often in-person position-specific training opportunities available at the district or council level. Garden State Council Training Page. Once you’ve completed all the required training for a position you can wear a “trained” tab on your uniform. If you have a thirst for knowledge, there are vast resources available to the interested. Guide to Safe Scouting: http://www.scouting.org/scoutsource/HealthandSafety/GSS.aspx A leader must be familiar with what Cub Scouts can and cannot do – based on BSA guidelines. As leaders, we have the program and policies to guide and back up our decisions, but ignorance is no excuse for putting the Scouts and Leaders at risk. There is also an online GSS app, PDF and book version to keep in your leader binder as a reference, if needed. There are lots of opportunities and resources available to learn more and improve yourself as a leader and Scouter. Basic Adult Leader Outdoor Orientation (BALOO): This one-and-a-half day course is designed as an introduction to the Cub Scout outdoor program for leaders interested in adding a camping component to their Pack activities. Completion of this course is mandatory for a MINIMUM OF ONE adult on a Pack overnighter. University of Scouting: Annual Council-led, in-person training event covering a variety of subjects, general studies, position-specific, and program-specific. Wood Badge: Wood Badge is an advanced, national leadership course open only to Scouting volunteers and professionals. Scouters from Cub Scouting, Boy Scouting, Varsity Scouting, Venturing, Sea Scouts, and Explorers, and district and council Scouters all are welcome and belong here.